Companies in all industries are responsible for training employees to perform their jobs safely and productively. If and when accidents happen on the job, is your company liable? One of the best ways to minimize risk and liability from job site accidents is to create a culture of safety in the workplace where employees take responsibility for reducing incidents and ensuring job site safety. One simple step in creating that culture is to require that staff conduct daily safety meetings that cover relevant safety topics related to the job at hand and in documenting safety meetings as they occur. Not only are safety meetings important for general business liability, but they are a requirement for OSHA compliance. Just holding safety meetings is not enough. Are you making sure that your safety meetings are well documented and can be accessed quickly upon request? Statements to the OSHA Compliance Officer like – “We hold daily tailgate meetings at each worksite” or “Our Supervisors train all the employees under their control how to do the job safely” tend to fall on deaf ears – unless you can prove the training was done with written documentation. · Roll call lists with names of all attendees including signatures to prove attendance? How Important is Safety Training Documentation? Employee Safety Training Records are among the first records that the inspector wants to see when an OSHA compliance audit is performed at your organization. Usually, the request for records occurs during the initial meeting – when the inspector must communicate the purpose of the audit. The audit meeting is mandated by OSHA regulations and it must occur before an inspection of a facility begins. When the request for audit documentation comes from the inspector, it’s imperative that you comply. Many organizations are not prepared and thus fines start adding up. If you have implemented a system where you can easily access the history of Employee Safety Training Records, it must include all pertinent data to validate compliance. For many organizations, the process of preparing for an audit consists of accessing a paper file folder and hoping that all paperwork is complete and up to date. We all know that hope is not a strategy when it comes to protecting your business assets and liability. Employees must understand the importance especially when not all organizations have safety managers or compliance officers that enforce the discipline of proper documentation. Because many organizations have paper-based processes, aggregating the data for summary reports can be a significant manual effort. Electronic data collection is becoming the norm and if you haven’t considered an electronic records collection and reporting system, your organization and most importantly your employees are at risk. 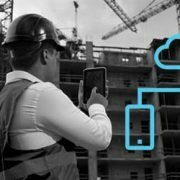 Kordata’s Safety Meeting Module was designed to make documenting safety meetings simple and easy using your tablet or phone in online or offline modes and will automatically sync the safety data to a central document and reporting system. Our Safety Meeting Module can be customized to your specific workflow including all pertinent data. 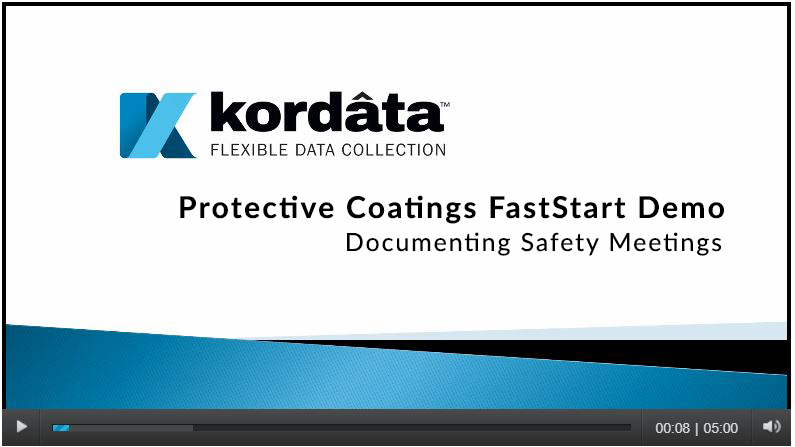 Kordata’s Safety Meeting Module supports all types of data while enforcing compliance with the help odrop-downwn menus, GPS coordinates and Google Map integration, documentation of weather conditions, location of meeting (Tailgate meeting, Ad Hoc, Facility and more), topics of discussion, and names and signatures of staff in attendance. 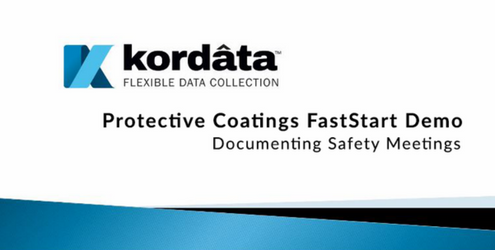 Collecting safety meeting data with Kordata is easy and ensures that the documentation of safety meetings is complete by enforcing compliance with required fields preventing staff from saving until all data is entered properly. Mobile data collection also increases ROI by reducing redundant data entry. Accidents do happen and if and when they do occur, proper documentation could potentially save you thousands of dollars in fines and most importantly preventing future accidents. Finally, and most importantly creating a culture of safety as a priority will not only save your company money but will reduce risk to employee safety.